Leadrio can automatically sync your contacts with our cloud partners. Your account must be a Manager to use this feature. When you link with a partner platform it will sync contacts for all of the accounts at your organisation. To connect an integration click the "Connect" button in the integrations status box. The next steps will depend on how the partner application manages its security. We have further documentation for each partner service. To disconnect an integration click the "Disconnect" button in the integrations status box. 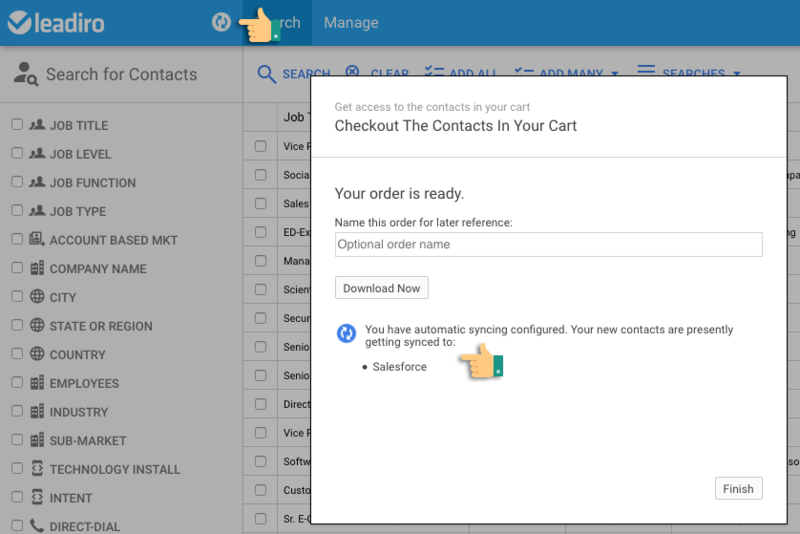 Once you have established a connection to a partner application then your contacts will automatically sync at checkout. The Checkout dialog will show you the partners that Leadiro is syncing with. You're free to close the dialog and continue searching for more contacts. Leadiro will handle the syncing process for you in the background. You will also get a syncing logo in the header, this shows you that syncing is in progress and will clear when all of your contacts have been synced.